I've had some correspondence with Richard Goode over the last week or so concerning the authors who wrote the Trigan Empire strip for Look and Learn some of which is worth repeating here as it's a subject that, as far as I'm aware, hasn't been explored before. Perhaps the main question that needed answering was: When did Mike Butterworth, the original writer of the Trigan Empire, leave the strip? Mike's style of writing is quite distinct when you read through the strip. Having typed up the texts of dozens of stories for the Don Lawrence Collection Trigan Empire volumes you get to know some of the phrases he favours; I can't tell you how many times I've typed the words "By the demons of Daveli" or "And then... it happened!" Richard's interest was in a story called 'The Curse of Zonn' which he was convinced was by Mike Butterworth. 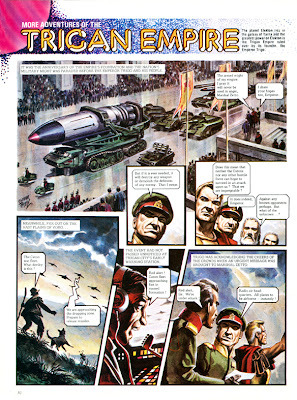 When I was writing the history of Look and Learn I'd mentioned that Gerry Wood had taken over the artwork on the strip from issue 834 (7 January 1978), which is a poor bit of wording... I should have said he'd taken over the strip full-time from that date as he'd already illustrated the 'Curse of Zonn' storyline in issues 820-825 (1 October-5 November 1977). This opened up the debate as to when Ken Roscoe had taken over as the author of the Trigan Empire strip as Gerry Wood had posted a message at the fan site The Trigan Empire saying that "The 188 episodes that I illustrated were all scripted by Ken Roscoe. When I agreed to illustrate Trigan in November 1977 Ken Roscoe was the writer and remained so until the magazine's closure." Gerry, too, is ignoring the first strip -- the six week's lead time from production to publication would mean that he is discussing the strips that began appearing in January 1978. However, 188 episodes encompassed his total contribution, hence the confusion. Both Richard and I agreed that 'The Curse of Zonn' was written by Mike Butterworth. There are too many common points of style for it not to be his work. But the next story, 'Battle For Survival', is not by Butterworth. It's very apparant from the opening episode that a new writer has taken over. Twice on the opening page, the character Marshal Zetto refers to Trigo as Emperor. Mike Butterworth would have had his military commanders say Imperial Majesty. Similarly, on page two, frame three, the opportunity to include the phrase "And then... it happened" is missed as the caption reads "What happened next was seen at close-quarters by only one man and his dog." (Butterworth would likely have favoured the terms "gelf herd" and "hound" rather than "shepherd" (used in frame 9) and "dog", although it could be a reference to the popular TV show.) And the startled shepherd utters the words, "By the twin moons of Daveli," which is meaningless -- all of Elekton has twin moons -- and, if written by Butterworth, would have been "By the demons of Daveli!" To my mind, the strip is clearly not by Mike Butterworth and, as I said to Richard, this could indicate the arrival of Ken Roscoe. 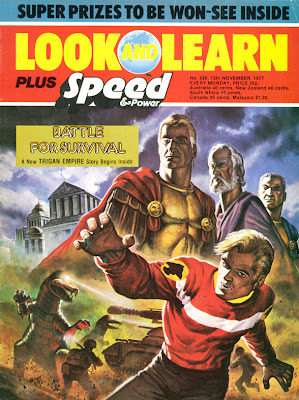 Richard, however, remained skeptical that 'Battle for Survival' was written by Ken Roscoe. "I always thought there was a discontinuity between 'Battle for Suvival' and 'The Killer'," he writes and, on closer examination there are differences between 'Battle' and the story that follows which, notably, is the the story where Gerry Wood took over which we know to be by Ken Roscoe. "One reason I think that 'Battle For Survival' is not a Ken Roscoe story is that it has a Butterworth-like twist in it. The adversary is defeated by a radio ham discovering the frequency which controls Thorg Lada's robot monsters. 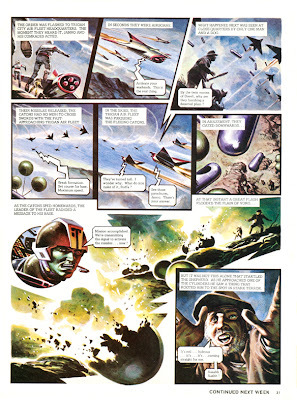 Whereas, five stories later in 'The Voyage of the Perici', the adversary is defeated more crassly by brute firepower. "Another reason is that the names of the new characters introduced in 'Battle For Survival' -- Marshal Zetto and Thorg Lada -- have a more authentic ring to them than do the names introduced in the following story -- e.g., Brinka and Broz." I'll add to this the fact that 'The Killer' not only introduces new characters but almost all the action takes place away from the Trigan Empire on a new planet. If this were Mike Butterworth, the hero of the story would have been Janno but Ken Roscoe introduces Brinka, a secret service agent, and allows him to take the lead in the story, as indeed he does two stories later. It was the repetition of the character Marshal Zetto (who appeared in 'Battle for Survival' and the second of the Ken Roscoe/Gerry Wood stories) that made me think that 'Battle' might be by Roscoe. However, he could simply have introduced the character for continuity. I now agree with Richard that 'Battle for Survival' is most likely not by Ken Roscoe. This ties in with a comment made by Jack Parker, editor of Look and Learn from 1977, who told me: "Butterworth decided that he'd had enough and that created all sorts of problems. We couldn't find anybody to take it over and we had a number of people try." Ken Roscoe established himself fairly quickly (within a few weeks) as the strip's regular scriptwriter, leaving that one story from the main run of the strip in Look and Learn still to have its author identified. 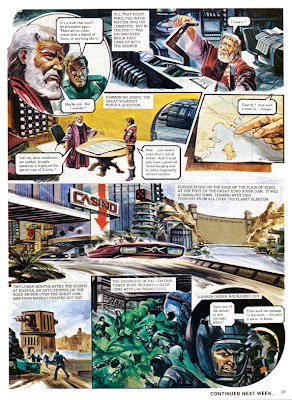 Who wrote the two stories that appeared in Ranger Annual and the text story in the Vulcan Summer Special is another matter entirely and one that also needs to be explored. None of them strike Richard or I as being by Butterworth.